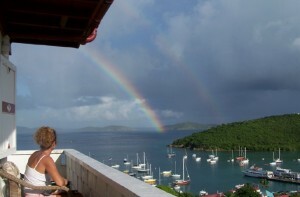 Looking out from Hillcrest Guest House on St. John Island in the US Virgin Islands. Hillcrest Guest House is a Caribbean vacation rental suites with Million Dollar Ocean Views. Suites include complimentary breakfast items, kitchenette, Free Wi-Fi, Air Conditioning and walking distance to down town Cruz Bay. $185 to 235/day. Book 5 days 20% off per day Suites have kitchenettes, private bathroom with shower and Free Wi-Fi. Our hotel in St. John’s residential area rises 2 stories above Cruz Bay, on the crest of the hill, minutes from the beach and the US National Park. Virgin Islands. Copyright © 2018 US Virgin Islands. All Rights Reserved. The Magazine Premium Theme by bavotasan.com.